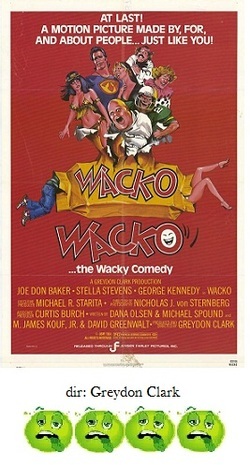 It's so difficult to review spoof comedies like Wacko, another in the genre begun by Airplane! in 1980. I can only say if I laughed or not. Needless to say, I did not. Wacko is a spoof on the popular slasher horror films of the early 80s, a genre that within two years had already established firm cliches that were ripe for goofing on. In this movie, our killer wears a cape and a freshly carved pumpkin on his head while pushing a lawnmower; he's known as, naturally, 'The Lawnmower Killer.' Anyway, 13 years prior, the killer struck the local high school's Halloween Pumpkin Prom and turned some seniors into so much pate. Jump to the present and the town is preparing to once again have their Pumpkin Prom. Our heroine is Julia Duffy, the younger sister of one of the original victims and who is 'screwed up by the horrible images for the rest of her life' (as one of the film's repetitious running jokes, this phrase is uttered about thirty times). Not only is she tense about the Prom, but she also plans to give up her virginity to her boyfriend, named Norman Bates. Yes, at a family dinner, Norman brings Mother's desiccated corpse, who is also set to babysit Duffy's younger brother, Damien (cue the score of The Omen). Joe Don Baker is also on hand as the histrionic detective in charge of 'The Lawnmower Killer' case. Basically, that's about all that happens within Wacko. The rest of the movie is just endless padding up until the night of the Pumpkin Prom when 'The Lawnmower Killer' finally....finally appears to wreak havoc. What have we got? Well, George Kennedy is on hand as Duffy's insane doctor father who keeps trying to spy on her in the bath or while changing clothes. And there is also a young Andrew "Dice" Clay (as Andrew Clay) as a classmate whose name is Tony Schlongini and he, yes, gets giant painful erections. The assistant principal is named Harry Palms and talks like a low-rent televangelist, and the science teacher is named Dr. Moreau. You see what I'm getting at here? We can see the inspirations for jokes-to-be that never materialize; it's as if they tossed in every thin idea they could think of without actually going anywhere with any of them. I will say that Julia Duffy is the only bright spot; she has great comic timing and can bring out a smile without trying too hard. She alone makes Wacko worthy of sitting all the way through. Kennedy, Clay and all the rest nearly give themselves hernias trying to make some laughs come alive, but they fail time and time again. Wacko fits comfortably within the company of the other slasher spoofs of the day. It's not quite as good as the middling Student Bodies or Pandemonium, but it's leagues better than the dreadful Saturday the 14th. After watching these four films, the genius of the Wayans Brothers' Scary Movie becomes more and more convincing.